My first big trip abroad was a Europe trip in 2008 and it was life-changing. My 35 days prancing around Europe in 2008 was the exact jolt I needed. I knew I needed to travel more, I wanted to go abroad and make a life of it but I had no idea how. So I did what many do around the world, I took an iconic Euro trip! That trip really solidified my ideas of traveling more in life. I had no idea how, but I knew I wanted it. How I did it is another story but three years later I was on a one-way flight out of the USA, never to return. And I have my group trip around Europe to thank. 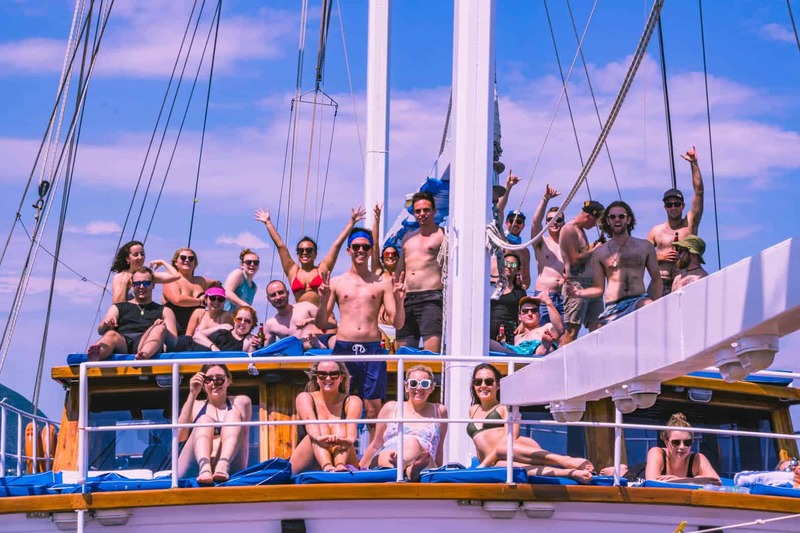 If you’re thinking of going abroad and don’t know where to start, are scared, alone, intimidated, and not even sure if you’d like traveling… taking a group trip around Europe is your best first intro into the life of intrepid adventures around the world and here’s why! It’s the most daunting part of traveling, especially when you’ve traveled very little or not at all. How do you get from Nice to Paris? And what’s the cheapest way? How do you get from Termini station to the Coliseum and then back to your hotel? 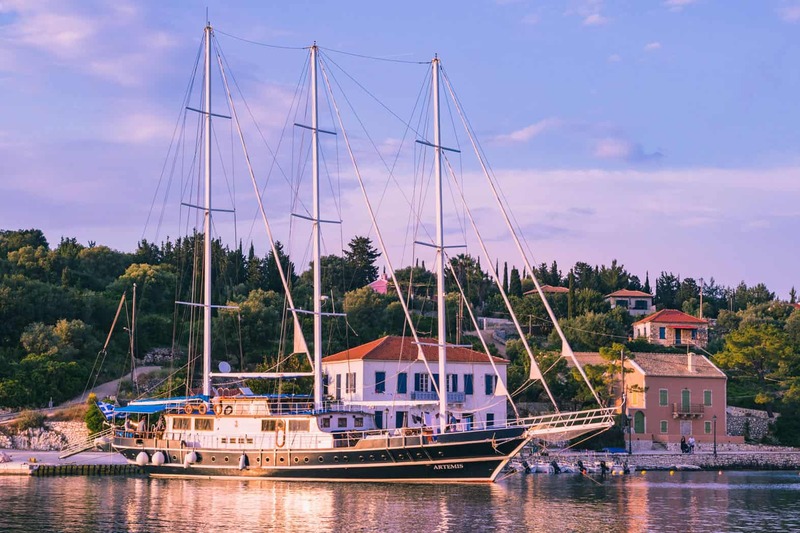 What’s the best sailboat company for sailing the Greek islands? What’s the best way to get back to the hotel after a night out in Barcelona? How do I order a vegetarian meal in a small town in Germany? These are just a fraction of the questions you’ll be presented with when traveling! You can feel overwhelmed and totally lost figuring out your travels if you haven’t done it before. There is A LOT to figure out and when you finally do, actually getting there and doing it can be scary and overwhelming when you’re in a new place. You’ll have to worry about common scams to avoid, tourist traps, the quickest way, the cheapest way… it’s not really a fun task to have when it’s your first time abroad! AT ALL. So the point? I think you know, booking a group trip tour through a company is the best option for newbie travelers! You literally just need to show up, I think you can manage that, right? RIGHT? You’ve been begging you homegirl Briana for a year to go abroad with you and she keeps saying she’ll think about it. You finally convinced your mate Matt to go abroad with you and guess what? He totally bailed last minute. FACT: You’ll make friends if you take a group trip. The best thing about booking an experience with a group is that you have built-in friends, EVEN if you’re an introvert! Tons of people go alone and some come with their friend that they somehow convinced (*miracles do happen*). But either way, you’ll fit right in and have an immediate posse to traipse the streets of London and share the ultimate spread of tapas with in Barcelona. Will you actually like the Austrian countryside? Will Paris be too busy for your taste? 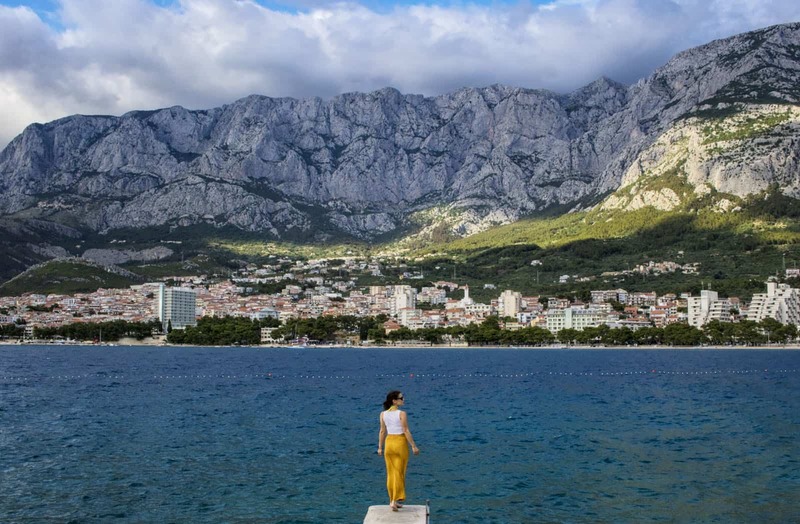 Maybe sailing the Greek islands isn’t for you (weirdo) and you’d prefer the more remote Swiss mountains? Either way, how do you know without experiencing it? While a group trip is usually a hurricane coming in quick, conquering and then blowing right over to the next place, you got a taste. That taste can be big enough for you to decide where you want to return to or perhaps cross of your list and focus your time elsewhere the next time you jet off abroad! Whirlwind group tours give you a massive bite of Europe. And there’s literally NO WAY you can see as much as a group trip offers, without a group trip… Trust me. I’m a pro traveler and figuring out the logistic of getting from Rome to Greece to Croatia in a few days while having fun in between is near impossible without your own tour bus and everything prebooked and executed to perfection. If you don’t have a lot of time and want to see as much as you can, a group trip is literally the only answer. This is SO important. When you’re set and ready to travel with a group not only do you have built-in friends but set in confidence as well. When you’re piling in with your new homies, you don’t feel as intimated taking on the metro system in Berlin or using your combined knowledge and three and a half words of French to politely say yes, you really do want another crepe, merci beaucoup! This confidence you have with your group will propel you into feeling like you’re a total badass traveler who can go do this alone somewhere else because guess what? You can! Building confidence with your group is the best first step to helping your mind get into the “I can do it” mindset. 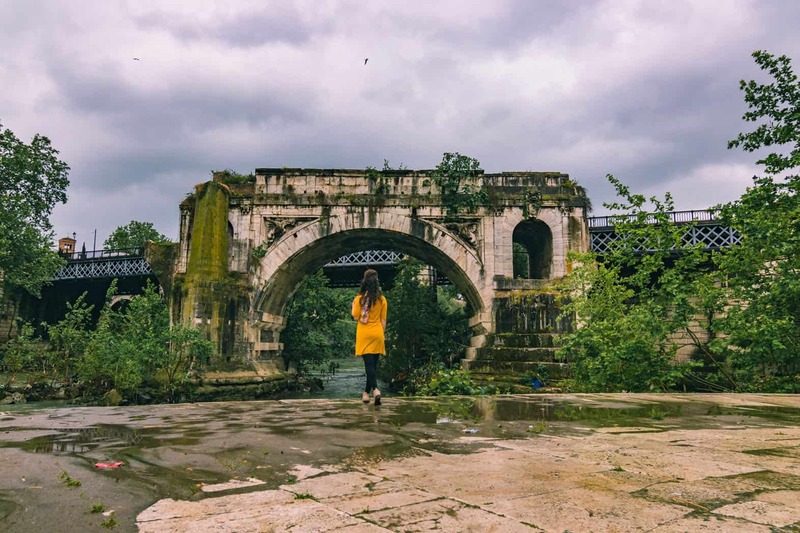 Particularly for Americans and Australians, and even first-timer travelers into mainland Europe from Ireland and the UK, traveling around Europe is hands down the easiest intro into traveling. Europe is probably the easiest continent to travel to! The cultures and ways of life are surely distinct and new but it’s not drastically different from the life you know back home. Sure the Spaniards think 11pm is a normal time for dinner and the Greek’s are on time if they are actually an hour late according to us, but these are small things and won’t take much to get used to. The way of life in Europe is very similar to that of back home and you’ll feel comfortable very quickly. 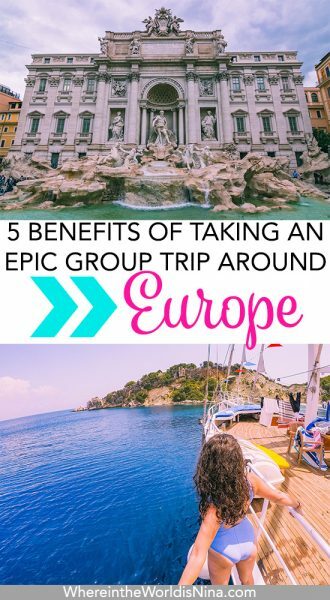 Of course, you could very well choose a group trip anywhere in the world but if you’re looking for the easiest to get your feet wet in, Europe’s your spot. OK, so Who to Book the Group Trip With? So where does one go to book an amazing group trip around Europe? What is the best company? I went ten years ago (omg, saying that make me feel so old! #ancient #grandma)! So uh, yeah, I had to dig a bit to see who is offering the most badass trip nowadays. In recent years, I’ve heard a lot about Topdeck, I even have a friend who worked for them! So I when I was invited to do some of their #Ultimate49 bucket list experiences, this past June, I nabbed the opportunity and tested them out for you all. Topdeck is a well-known company traipsing the globe with people like you and me and showing them the best of the best. The adventure I happen to be apart was rad AF. What Did I Do With Topdeck? I went through a whirlwind of history and pizza in Rome. Exploring the ancient relics of the Coliseum, the insanity that is the Sistine Chapel, the Vatican and all of its glory, and everything about the ancient Roman Empire. It had been ten years since I’ve seen it, and I was just as awestruck as I was the first time. I even sidestepped a bit and explored the lesser visited Trastevere to get out of the hustle of the main tourist area and the contrast is incredible while still offering plenty to see! 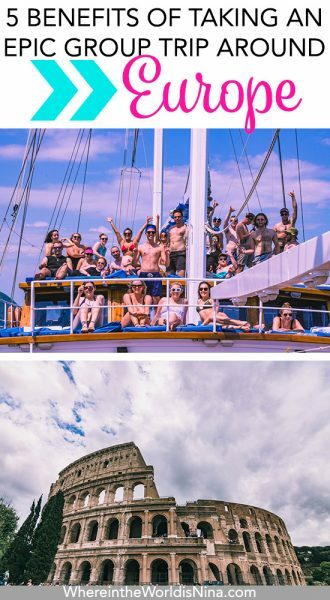 After I was plump from all the pizza and pasta, Topdeck was rude enough to throw me into a bikini and send me to Greece… on a sailboat. Besides regretting my less than bodacious bikini bod (I blame Italy! ), I accepted my place on the sailboat. Tough choices, right? For three whole glorious days, we sailed the Ionian Sea with our buns in the sun, azure waters in every direction, the best seafood I’ve ever put in my mouth, and three islands for the taking. 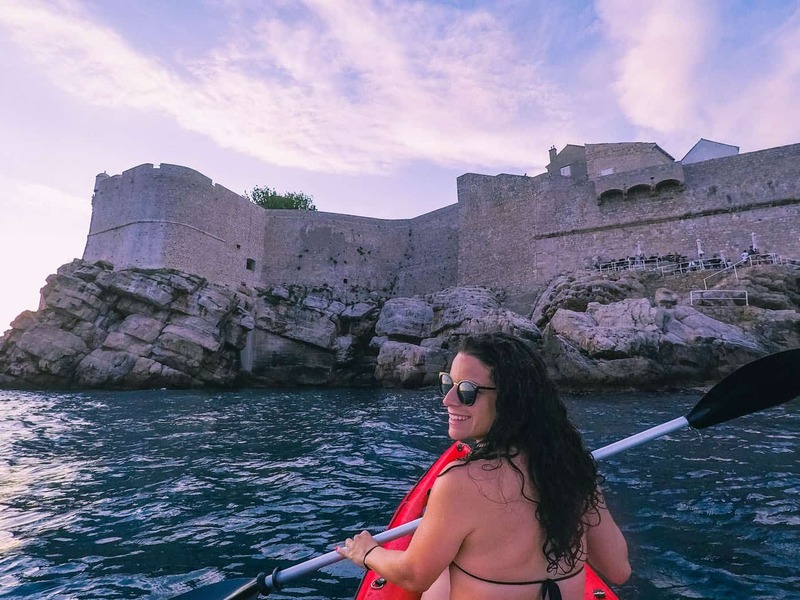 Being back in one of my favorite countries in the world, I immediately “dobar dan-ed” my way around Dubrovnik, wandered the old city and its walls and then took straight to the water, of course! A bit warmer than Greece’s swimming pool, the Adriatic Sea provided a glassy surface for a badass kayaking adventure. While wandering the old wall is awesome, it’s pretty #basic when you compare it to kayaking around the walls instead. 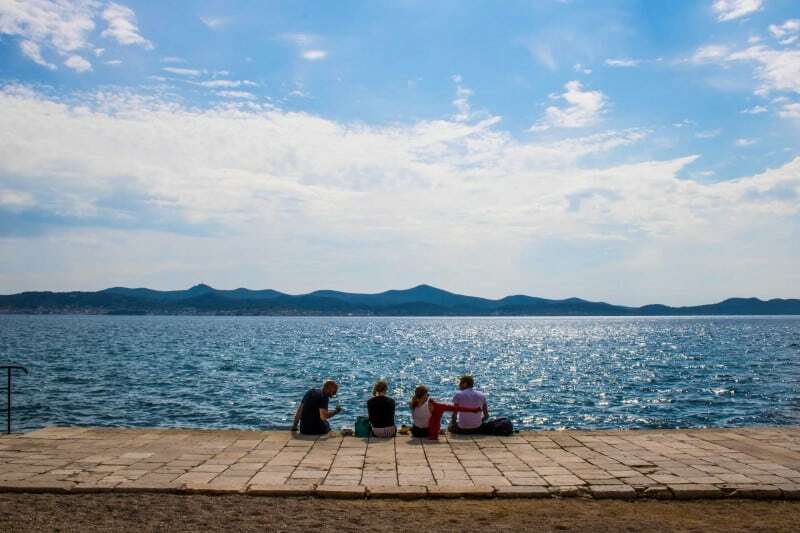 Pair this with a cool cave and a lap around Lokrum Island all at sunset, and you’re golden! Literally, I came back nice and tan! This is just a taste of what a cool trip around Europe as your first time abroad or first big trip can look like. And Topdeck would love to show you around. 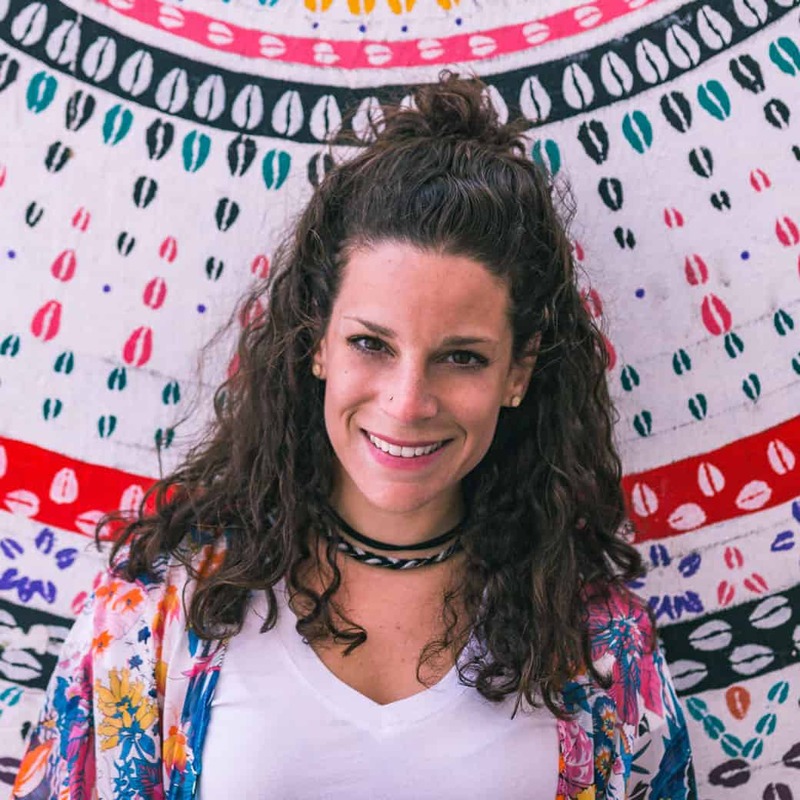 If you’re looking to get abroad and don’t know where to start, go on a whirlwind tour and get a taste, no—a massive bite—on what traveling is like! Who knows? Maybe you’ll meet someone who is crazy enough to continue traveling a bit unlike your lame friends at home! Like I’ve mentioned, I don’t think I would be where I am today if it wasn’t for my group trip abroad ten years ago. Perhaps this trip can be a turning point for you as well? Interested in going on a trip like this? Click here and get on a Topdeck adventure ASAP! 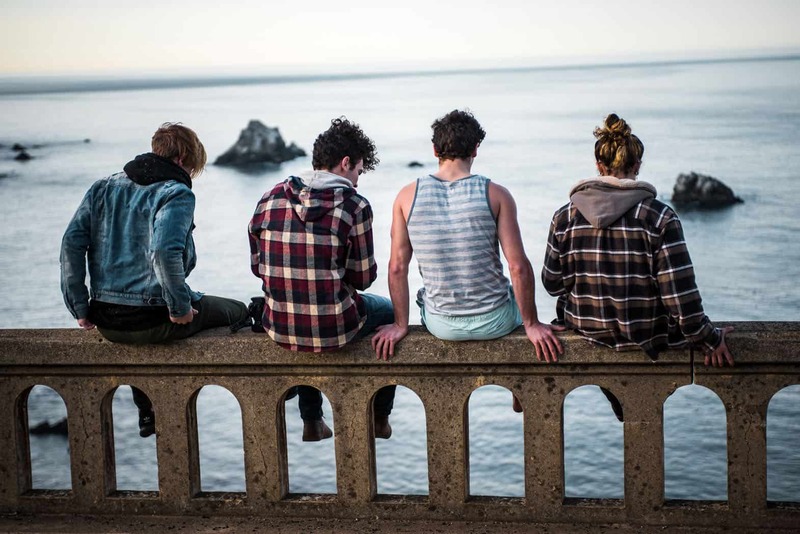 Would you go on a group trip for your first time abroad? Have you? Let us know in the comments!